This week’s roundup of best things to do has already got our mouths watering, with an array of unmissable dining experiences. Over at Sermsuk Warehouse, Mad Face Food Week makes its return — expect the same concept as last year’s food-related event, except bigger and better. Over at Bo.lan, Bangkok’s top dining establishments — including Gaa, 80/20, Samuay and Sons, and 100 Mahaseth — join hands for a charity dinner. Proceeds will go to supporting Thai elephants, by attaching collars to two of them in order to both learn how to better protect elephants and learn more about the livelihood of local farmers. This week also sees a fair share of fun parties and cultural happenings, as Kolour in the Park also makes its fifth return, and Bangkok Screening Room hosts its inaugural feminist film festival. Scroll to see your plans for the week! WINE & DINE — This week, Bangkok gourmets get the chance to dine out for a good cause, as Bo.lan teams up with the World Wild Fund For Nature Thailand (WWF) for a fundraising dinner in support of Thai elephants. The event sees a collaboration between some of the most reputed names in Bangkok’s gourmet scene as Gaa’s Garima Arora, 80/20’s Joe and Saki, Samuay and Sons’ chef Num, 100 Mahaseth’s Chalee, chef Prin (formerly of Nahm) and of course, Bo.lan’s Bo and Dylan, join hands for a dining experience not to be missed. A six course dinner, guests can opt to have their plates complemented by wines from IQ Wines. 6pm onwards. Bo.lan. 24 Sukhumvit 53 Alley, Khwaeng Khlong Tan Nuea, Khet Watthana, Krung Thep Maha Nakhon 10110. THB4,500++ per person (includes wine pairing). THB3,800++ for food only. WINE & DINE — One of Bangkok’s biggest food events, Mad Face Food Week is back for seconds. 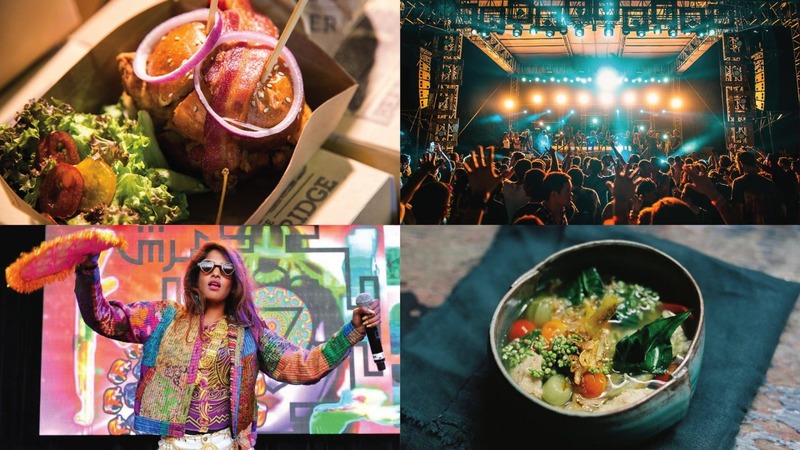 This year, expect over 60 stalls — double of what was offered last year — featuring the very best from Bangkok’s gourmet scene. Food comes in fun categories — ‘Sugar Rush’, for those heavenly butter-laden pastries, to ‘Ooh Baby, I like it Raw’ for the freshest seafood offers. Chinatown lovers, ‘Old Town-ers’ has you covered, while over at ‘Fresh off the Farm’, lovers of organic, natural-grown produce have a lot to look forward to. This year’s event also comes with a friendly Mad Face-off culinary competition, three exclusive private dinners and two sunset dinner cruises — if a dinner cruise is not for you, there will also be two Mad Face boat parties, so get ready to dance and dine the night away! 3pm-midnight. Sermsuk Warehouse (between Charoen Nakhon 13 and 15). Khlong Ton Sai, Khlong San, Bangkok 10600. THB100 per day (includes one free drink). NEWS & EVENTS — Singha Music’s annual celebration of art and sound is back… for the fifth year! Kolour in the Park 2019 marks the festival’s half-decade mark, with an exciting series of activities in store. Get ready for an international lineup over three stages, immersive stage art, large-scale art installations, and even a gourmet food market to satisfy your hunger pangs as you let loose and party. There will also be art and craft activities, water games, lake swimming and free Thai massages so you don’t burn out over the weekend. 1pm-midnight. THB3,900 for Kolour Plus+ tickets. THB2,100 for regular door tickets. ART & CULTURE — Khopfa Chanpensri’s latest work, ‘Meraki’ is inspired by performance art that intends for audiences to become the performers. An interactive, engaging work, the performance is based on the concept of putting something of yourself into artwork. As audiences visit the exhibition, they too become a part of the art pieces in the space, through manipulation of light and shadows. 4:30-6:30pm. Bangkok Art and Culture Centre. 939 Rama I Rd, Khwaeng Wang Mai, Khet Pathum Wan, Krung Thep Maha Nakhon 10330. ART & CULTURE — Celebrating International Women’s Day, Woof Pack’s contemporary cinema space Bangkok Screening Room collaborates with Converse to host the inaugural Fem Film Festival. Expect a showcase of ten films exploring both the struggles and achievements of women in professional industries, politics, love and life. The festival aims to raise awareness of feminist issues, create a voice of equality and celebrate women from all across the world. There will also be a special talk with with Lakana Panvichai, well-known feminist, author and social critic. Bangkok Screening Room. 1/3-7 Sala Daeng 1 Alley, Khwaeng Silom, Khet Bang Rak, Krung Thep Maha Nakhon 10500.